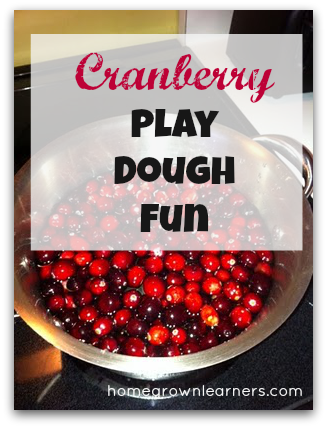 Exploding Cranberries for Play Dough - and Some Fun Creations! We had lots of fun today! Thank you to Homeschool Mo for giving me the idea to make Cranberry Play Dough! I recently discovered her blog and I know you will like it, too! Wait until you start seeing and hearing them pop open.... we just had discussed yesterday in math what the boiling point of water was... so this was a good connection. The kids LOVED watching the cranberries explode! Let the water cool for a little while (probably long enough to complete your math and grammar lessons for the day!). Then, over medium heat, combine 2 cups of flour, 1 cup of salt, 2 tablespoons vegetable oil, and the cranberry water. Stir CONSTANTLY (about 5 minutes) until the mixture pulls away from the sides and turns into play dough. I was so proud of the children's creations - they sat at the kitchen table for nearly two hours. (The darker play dough you see if left over Apple Pie Play Dough from the Fall!) We listened to lots of Classical Christmas music, so we got in our music lesson for the day as well. The kids want these to set out and dry and then give them to Santa as a gift when we pay him a visit on Saturday. They also want to use them as decorations around the house. It was a GOOD morning... I love it when that happens!